The period between July and September is normally a dull season for luxury hotel chains whose fortunes are linked to business travel and inbound tourism. This season, hotels may be worse off, as a global recession and a cutback on discretionary spending by corporate houses overlap with an increase in room supply. Hotels with higher exposure to leisure destinations are expected to register barely 53% occupancy rates. What’s encouraging for tourism as a whole is the 10% increase in foreign tourist arrivals from January till September over the year-ago period. But analysts feel that this may not reflect in increased revenue and profit for luxury hotels, mainly because of stiff competition from the relatively less expensive mid-sized hotels such as Taj GVK Hotels and Resorts Ltd, Royal Orchid Hotels Ltd and Kamat Hotels India Ltd.
Economic recession and increased competition will also hit average room rates (ARR), at least until demand catches up a few quarters down the line. In a report, Rashesh Shah of ICICI Securities Ltd says, “ARR is expected to increase by a mere 1-2% year-on-year mainly to offset rising cost pressure." Meanwhile, capacity addition even in the premium segment from the likes of Indian Hotels Co. Ltd, EIH Ltd and Hotel Leelaventure Ltd has already translated into higher fixed overheads, which account for about 35% of the total operating cost of a premium hotel. Obviously, lower revenue and higher operating costs will hit profitability. An Edelweiss Securities Ltd report says that operating margins for the September quarter could be in the region of 12-15%. This is less than half the margins clocked during the peak period of 2006-07. Poor operating returns, along with higher interest and depreciation costs, would crimp profits across the sector during the quarter. Hence, in the near term, the hotel sector seems far from comforting for investors. Hotel stocks have taken a beating. Market capitalization of most stocks is down to half compared with that a year ago. 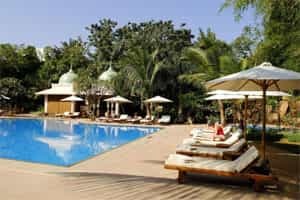 However, while the Street has already factored in the falling fortunes of hotel firms for the near term, management cues on occupancy rates and tariff revisions for the forthcoming tourism season will determine stock valuations.